(First girl flings out her non-Twilight-clutching hand to catch the right words, and seizes a vague term from a past English class). I had to share. Actually, that’s a pretty darn good summation, for a love triangle between a human, a vampire and a werewolf! Things the NY Times Book Review gets in the mail. So far, I haven’t gotten any fun “bonus mail” at my library. At the bank where I worked during grad school, I scored some candy, and a truly hideous flag pin. We had a film workshop for teens today, put on by CandyEye Factory. I didn’t get a chance to take a peek at what all was going on (I was on lunch), but I did get a button after the event was over. I am pleased and amused, and promptly attached it to my name tag. I won’t wear it every day though, as I already have quite enough problems with patrons taking me seriously. This Hennepin History Museum exhibition uses shoes from the HHM permanent collections as a backdrop for a collection of shoes from those who work, play, heal, protect, defend, prosecute, paint, make music, drive buses, cabs, fire engines, dance, act, give us the news, enthrall us on the radio, cook, save lives, and just try to get by in Hennepin County. The exhibition will showcase a spectacular collection of vintage wedding shoes, slippers, carriage boots, stiletto pumps, clogs, wedgies, sandals, platforms, hiking boots, and a superb collection of children’s and infants shoes. The show will be tastefully accessorized by vintage handbags, purses, and a few suitably chosen hats. I read this book for the first time when I was about 13. I liked it fine, and I enjoyed seeing how the friendship between Reuven and Danny developed, and I thought it was a good story, well told. I didn’t *love* it, but I certainly enjoyed it. I also read The Promise, which I didn’t enjoy nearly as much. On this re-read, I am completely blown out of the water. It’s so much more powerful than I remember it being, and I want to read it constantly. I hate having to put it down. This is not a new experience for me, loving a book this much, but it is the first time I’ve revised my opinion in this way–usually I realise that a book I loved when I was younger really isn’t all that great. Is it just because I’m older now, and I’m coming to the story from a different perspective? It is because I can better relate to the experiences Danny and Reuven have? Is it simply because I’m a more mature reader? I am very curious to re-read The Promise now, to see if my feelings about that have changed as well. All I really remember is that they’re in grad school, and Danny gets the girl. 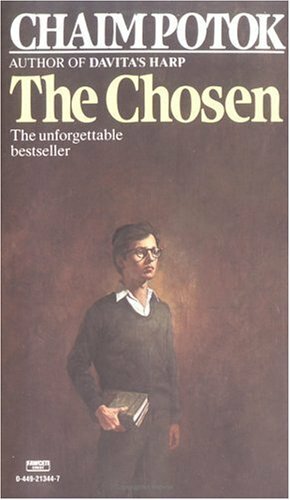 I only read that one once; I know I’ve read The Chosen at least twice before. I’m also curious to see if my love for My Name is Asher Lev holds true, and I’ll have to give The Gift of Asher Lev another chance as well.